This is the third week of our Great Outdoors challenge. Have you entered your cards yet? 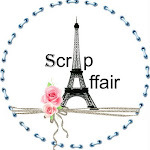 Our sponsor this month is our very own Nadia from Scrap Affair. I had the opportunity to meet Nadia in person this week as she and her family are vacationing in Victoria, BC. Nadia is offering the random winner 40% their entire purchase! Don't forget to add GDT to your link if you wish to be considered for a guest spot. We would love to tell our readers more about you and showcase your beautiful work. 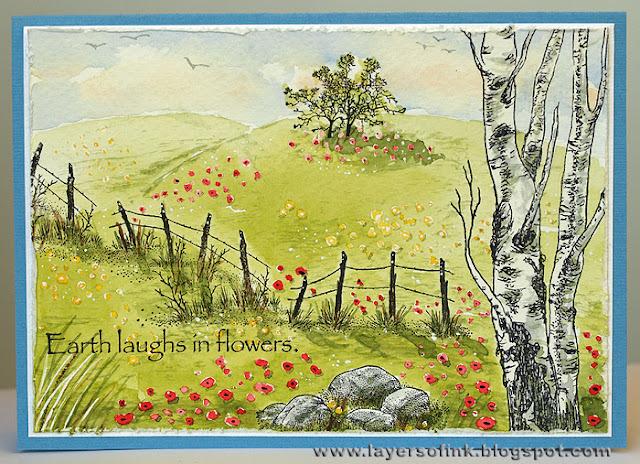 Anna-Karin from Layers of Ink has a wonderful card for you today. I felt like doing a watercolour scene and also played around with some masking fluid for the flowers, grasses and the Birch trees. I was happy to discover that the masking fluid didn't affect the Jet Black Archival Ink on the tree at all. You may enter up to 3 times and as many other challenges as you wish. If you do not have a blog or account on Split Coast Stampers, then just email me a picture of the piece and I will add it to one of our posts. Click here to find Mr. Linky. beautiful...beautiful...great these stamps and colouring!! the scene looks like a painting. so lovely to see that. The Great Outdoors - Final Week!